MAGICBLADE™R is a new design that offers continuous double rotation on PAN/TILT axes. 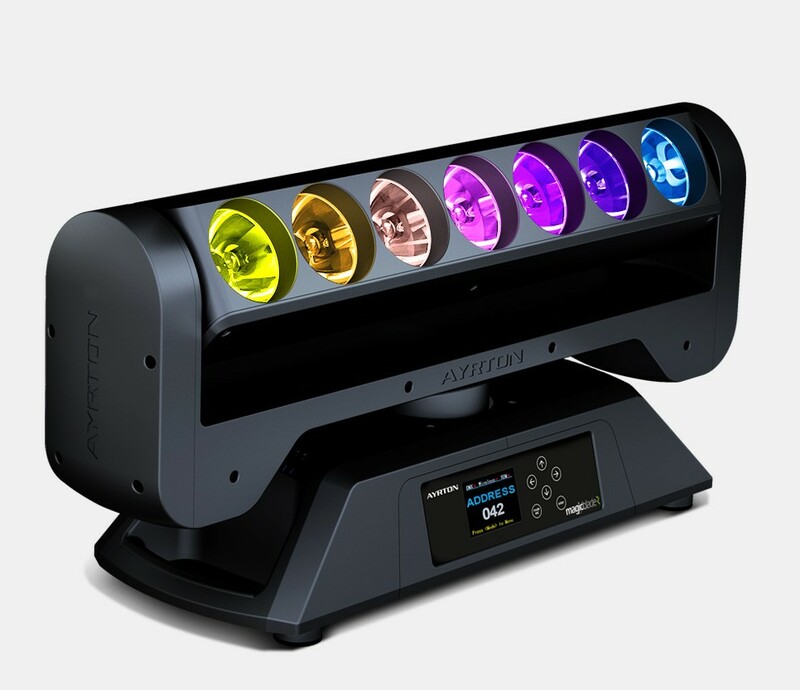 Its unique feature is the layout of its seven RGBW LED sources in-line, paired with the highly intensive angle of the optics, which allow the creation of light curtains with genuine overall consistency. On stage, MAGICBLADE™R’s very high centre beam intensity enables excellent visual perception of the beams in an environment saturated with light – vital in the creation of virtual décor. AYRTON™ has opted for a compact design for MAGICBLADE™R, with the primary objective of reducing the visual footprint of its luminaires. This allows MAGICBLADE™R to be installed in many unique positions and, coupled with the individual control of the 7 RGBW LED sources, enables the creation of a multitude of new effects. MAGICBLADE™R integrates a fast 32-bit circuit board that has been developed to give highly flexible management of the numerous channels necessary for point-by-point control and for large scale installations utilising hundreds of luminaires. MAGICBLADE™R benefits from extensive connectivity and can be controlled by DMX-RDM, Art-Net™ or via LumenRadio™ DMX-RDM wireless connection. It is equipped with new generation three-phase stepper motors that allow quick and precise movement essential for it style of application. Very compact, these new motors fit perfectly into the minimalist design of the luminaire.